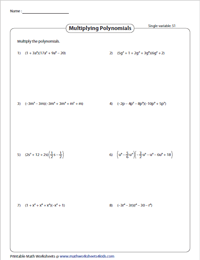 Explore these multiplying polynomials worksheets with answer keys that consist of a set of polynomials to be multiplied by monomials, binomials, trinomials and polynomials; involving single and multivariables. 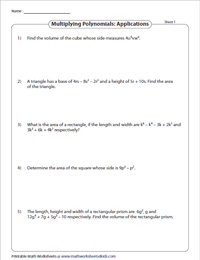 Simple word problems to find the area and volume of geometrical shapes have been included as well. Determine the values of unknown constants or expressions in the given polynomial equations as well. 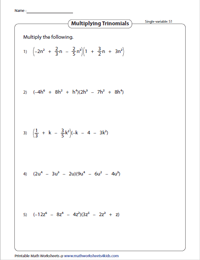 Multiply the coefficients of one term with the other, add the exponents with the same base in these multiplication of monomial by monomial PDFs; consisting of 2 or 3 monomials with single and multivariables. 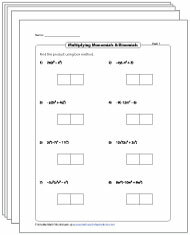 Multiply the monomial with each term inside the parentheses of binomials; in these multiplication worksheets. Answer keys are included. 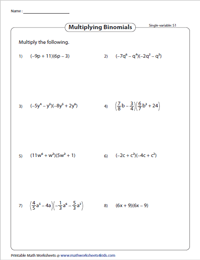 Determine the product of the given monomial and polynomial using the distributive property with this set of multiplication worksheets. 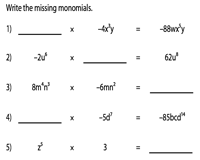 Challenge your skills with this set of multiplication equations consisting of missing monomials. Complete the multiplication statement by plugging in the missing factor or product. Multiply each term of the first binomial with every term of the second binomial, in these multiplication of binomial by binomial worksheets comprising of eight unique expressions with single and multivariables. 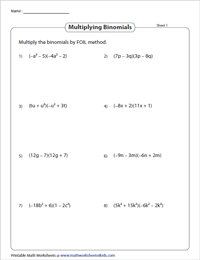 The FOIL method makes binomial multiplication simple and easy. Solve these multiplying binomials- FOIL worksheets by multiplying the binomials in the order: First, Outer, Inner and Last terms. 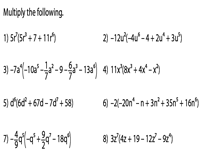 Review the concept of binomial multiplication by working on the eight single and multivariable algebraic expressions enclosed in each worksheet. Learn to multiply trinomials quickly and accurately, using the distributive property and product rule for exponents. Multiply the two trinomials, put the like terms together to determine their product. Determine the unknown value by comparing the corresponding coefficients of the product of the polynomials to the given polynomial expression. Figure out the area and volume of geometrical shapes by substituting the known parameters like length, width, base, height in appropriate formulas. 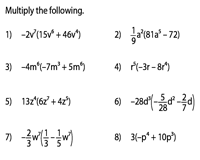 The worksheets contain problems in the word format. 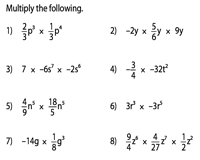 Learn how to multiply polynomials using the box method. 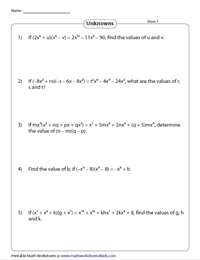 The worksheets feature grids or boxes to multiply monomials, binomials and polynomials.